A Portuguese court has overturned a ban on a book in which it is claimed that Madeleine McCann's body was hidden by her parents after she died on holiday. Three-year-old Madeleine disappeared from her holiday apartment in the resort of Praia da Luz while her parents were dining with friends in May 2007. It was assumed the child was abducted and her parents, Gerry and Kate McCann, believe she is still alive. 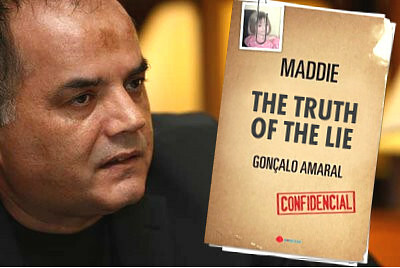 The book in question, Maddie: a Verdade da Mentira (Maddie: the Truth of the Lie), was written by Goncalo Amaral, the police inspector who led the investigation into Madeleine's disappearance from May until October 2007. The book was published in July 2008, but the McCanns, who deny Amaral's assertions, took legal action and a year later a court banned sales of the book and forbade Amaral from repeating his claims about the McCanns. In February this year, the ban was upheld. Now a judge has ruled that the ban on the book was a breach of "a constitutional and universal right: that of opinion and freedom of expression". According to the court, "The contents of the book do not breach the basic rights of the plaintiffs." 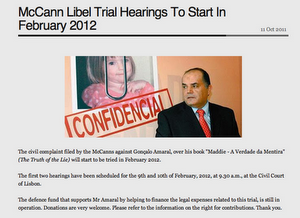 In his book, Amaral claims that Madeleine died in a tragic accident and her parents then hid the body. He also questioned why Gerry and Kate McCann had to employ a spokesman and said they were too close to British police. After his court victory, Amaral told reporters: "The book is an exercise in freedom of speech. Portuguese democracy has won, as banning the book was unconstitutional."